Swapping hoses and pumps for electric motors and electronic control. The conventional hydraulically-assisted power steering used in most cars is soon to be replaced with electric power steering. Already, many manufacturers are using electronically controlled hydraulic systems, while some car manufacturers have recently introduced purely electric systems to their vehicles. In addition to reducing engine loads, full electric power steering allows steering responsiveness to be automatically varied depending on speed, road conditions - and even the driver's ability! Hydraulic Power Assisted Steering has been used in automotive applications for about 50 years. The systems use an engine-driven hydraulic pump, a control valve, steering cylinder and connecting hydraulic hoses. The pump is usually of a vane design with an integrated internal bypass. It is sized so that - even at idle rpm - it delivers enough oil flow to provide a suitable degree of power assistance. The control valve uses a flexible torque-measuring device (such as a torsion bar, spiral spring or leaf spring) to convert the steering torque into a small control movement. This movement is transferred to a valve that regulates fluid flow to the power assistance mechanism. In rack and pinion steering, a double-ended hydraulic ram mounted parallel to the rack (within the rack assembly) is used, while recirculating ball systems incorporate the mechanism into the steering box. Note that in the Nissan system shown here, the fluid reservoir is incorporated into the pump. A major problem with simple conventional hydraulic steering systems is that the assistance level is not reduced at high speeds, giving a lack of steering feel. American cars of the Fifties and Sixties were particularly well known for their feather-light steering effort during parking, a characteristic which resulted in extreme vagueness at high speeds. To overcome this problem, most conventional hydraulic steering systems of the last few decades have incorporated mechanisms that reduce steering assistance as either engine speed increases, or (less frequently) as road speed increases. The reason that engine speed was more commonly used as is that such a system can remain purely hydraulic, whereas using road speed as the control variable requires the use of an electronic system. The introduction of electronic speedometers - and subsequently, full engine management - meant that an electronic road speed signal became available, allowing the widespread use of electronically-controlled hydraulic steering systems. These vary steering effort depending on road speed and also, in some cases, other factors as well. A solenoid valve is located on the discharge port of the hydraulic pump. Electronic control is used to control the solenoid valve opening, so regulating the fluid flow. The flow is reduced at high road speeds, reducing the degree of assistance provided. A solenoid valve and associated bypass line is located between the two chambers of the hydraulic cylinder, allowing the reduction of the pressure difference between them. The solenoid valve opening is controlled electronically, its opening being greater at high road speeds. This reduces the degree of assistance that is provided. A hydraulic force is enabled that works against the power assistance. As speed increases, the reaction force is increased. Since fluid flow to the power cylinder is not affected, the steering response rate can remain high without reductions occurring in feel. In their electronically-controlled hydraulic steering system, Hyundai use an ECU equipped with an 8-bit microprocessor. Two major inputs - vehicle speed and the speed of steering wheel movement - are used. From these inputs, the ECU determines the driving condition and via a 3-dimensional look-up map, provides the appropriate current flow to a hydraulic solenoid valve. Parking - maximum current is supplied to the solenoid valve, resulting in maximum steering assistance. High Speed - minimum current is supplied to the solenoid valve, resulting in minimum steering assistance. Evasive Steering - a large and sudden steering input causes the ECU to supply a current to the solenoid proportional to the speed of the steering input. There are plenty of speed-sensitive hydraulic steering systems around. This diagram shows the layout of a Mazda MX6 system where the degree of assistance is based on road speed and steering angle. 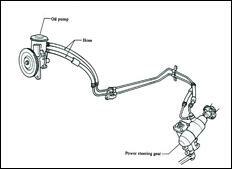 (1) steering wheel; (2) steering shaft; (3) intermediate shaft; (4) steering gear assembly; (5) pressure hose; (6) return hose; (7) oil pump; (8) solenoid valve; (9) ECU; (10) reserve tank; (11) steering angle sensor; (12) check connector. Hybrid hydraulic steering systems use an electric motor to drive the hydraulic pump, rather than having the pump driven directly by the engine. This approach allows the steering effort to be easily controlled by varying the pump speed. Because flow can be better matched to actual requirements, the power drain is reduced - fuel economy savings of up to 0.2 litres/100 km are possible. Driving Mode - where driving conditions (such as city, country, highway, etc) are automatically judged with appropriate levels of assistance then provided. Steering Wheel Input Mode- where the speed of the steering wheel movement is used to determine the degree of assistance required. Steering Load Mode - where demand for power assistance is indicated by the counter-pressure of the hydraulic fluid, sensed through variations in the motor current load. The General Motors hybrid hydraulic steering system shown here uses Steering Load Mode to determine the actual steering loads and so the degree of assistance that needs to be provided. The 3-phase brushless DC motor (12) is supplied power by the Motor Power Circuit. 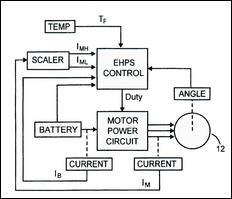 The EHPS control provides a control signal to the Motor Power Circuit in response to input signals from the motor angle sensor, motor current sensor and battery current sensor as well as operating system voltage. The temperature of the hydraulic fluid is also monitored. Electric Power-Assisted Steering completely replaces the hydraulic system that previously has always been associated with power steering. 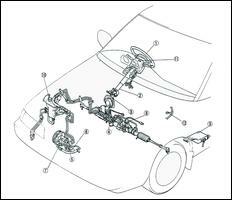 Electric power steering systems assist driver effort by the use of an electric motor which acts through a reversible gearbox and in some cases, also an electromagnetic clutch. An electronic control unit determines the degree of assistance that is rendered. 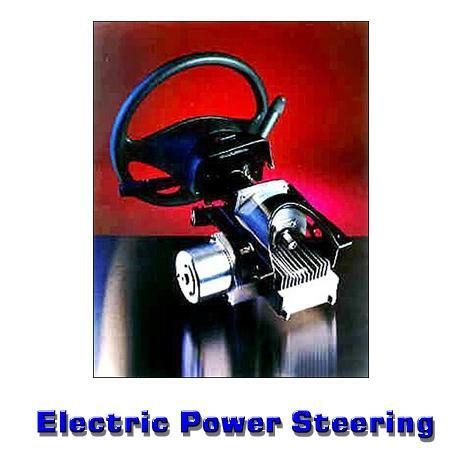 Electric power steering has some significant advantages over any form of conventional hydraulic steering, both for the owner of the car and its manufacturer. The reduction in engine load of an electric power steering system (it can be as low as 4 watts when the car is being driven in a straight line) means that the fuel economy of a car equipped with electric power steering is very similar to that of a car with no form of power steering. Analyses provided by manufacturers of electric power steering systems indicate potential fuel savings of 4-8 per cent over cars equipped with conventional hydraulic steering, with the lighter mass of an electric power steering also having an impact here. The independence of the system from engine operation also means that should the engine stall, steering assistance does not change. From a manufacturer's perspective, using electric power steering reduces assembly line time, allows the easy software tuning of the steering assistance characteristics to suit a variety of cars (eg a sports car or a limousine - more on this in a minute), and has the potential to improve reliability - 53 per cent of all power steering warranty claims are from pump and hose problems. Environmental gains are also possible from the decreased production and disposal of hydraulic fluid (worldwide, an estimated 40 million litres of power steering fluid was in use in 1995) and from the decreased requirement for the non-recyclable polymers used in hydraulic hoses. So, How Good is Your Driving? One of the most interesting aspects of electric power steering is the ability that the manufacturer has to tune the system's responsiveness. As indicated earlier, this allows the easy software matching of a single electric power steering to applications as diverse as a two-seater sports car or luxury sedan, but it also means that system responsiveness can be made to vary in different driving situations in the one car. When this approach is taken, the input by the driver of a certain amount of steering lock does not always result in the same degree of assistance - should the ECU determine that such a steering movement is not appropriate for the conditions, the steering assistance may be reduced or the steering input even actively resisted! a road friction estimate input. The 'driver skill estimation device' analyses the actual path taken by the vehicle and compares this with a computed target trajectory. Using this and data on the vehicle wheelbase, the distance that the front and rear wheels are from the vehicle centre of gravity (and other factors), the system awards the driver an ability that varies on five levels from "very poor" to "very good". A very good driver is rewarded with very little steering force resistance (the driver gets what he or she asks for), while a poor driver will encounter steering that actively does not allow major steering inputs to be made at high speed. According to Honda, this allows the skilled driver to "positively control the turning behaviour of the vehicle so as to briskly manoeuvre the vehicle. Conversely, if the vehicle operator is not skilled, the control system produces a reaction which prevents the vehicle operator from over-reacting to the vehicle response, and (so) stabilises the vehicle." But you have to wonder what happens when a 'very poor' driver suddenly needs to swerve around a child that runs out onto the road.... However, the Honda system does provide a very strong indication of the direction that electric power steering systems can be expected to follow in the future.